April 02, 2019 - "Press Releases"
ARE ALL CLOSED-LOOP STEPPER SYSTEMS CREATED EQUAL? No. Some manufacturers give the closed-loop stepper systems similar-sounding descriptions, which confuses the marketplace. As proof of the confusion, it’s not uncommon that a designer requests one capability and actually needs another. WHAT ARE THE MOST COMMON CLOSED-LOOP STEPPER SYSTEMS? There are three common types: Closed-loop stepper with step-loss compensation; closed-loop stepper with load position control; and closed-loop stepper servo control. Stepper-drive manufacturers call them all “closed loop” but the three have distinct functionalities. WHAT ARE THE FUNCTIONALITIES OF THESE CLOSED-LOOP STEPPER SYSTEMS? Closed-loop stepper with step-loss compensation is the most common type of closed-loop stepper control. The stepper drive operates as a micro-stepping drive and typically receives pulse and direction commands to move to the desired position. An encoder tracks shaft or load position. If lost steps are detected, a compensation algorithm inserts additional steps so that the motor shaft (or load) arrives at the desired position. Typically, the stepper-motor drive has settings for two currents: The motor gets running current when in motion and gets resting current when stopped. In closed-loop stepper with load-position control, the stepper drive operates as a common microstepping drive and typically receives pulse and direction commands to move to the desired position. The encoder (typically mounted on the load) monitors the load’s position. The closed-loop algorithm dynamically tracks the load position and compensates throughout the move profile. Typically, the motor gets running current when in motion and gets resting current when stopped. Closed-loop stepper servo control treats the stepper motor like a high-pole-count brushless motor, turning it into a servomotor. A shaft-mounted encoder detects shaft position to determine the proper current vector. A pulse and direction interface may be offered in this type of drive, but the position controller doesn’t use steps to get to the desired position. Instead, closed-loop algorithms control motor torque to servo the shaft into position using a position control loop (a PID loop for example). In this mode, the current setting is dynamic. 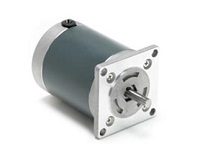 The stepper drive delivers only the amount of current needed to move the motor shaft and load into position. WHAT ARE THE ADVANTAGES AND DISADVANTAGES OF THE DIFFERENT FUNCTIONALITIES? These types of algorithms can be used in many point-to-point motion applications but are less useful for maintaining a profiled trajectory under varying load. This type of control suffers from the main weakness of traditional stepper motor control: Once pullout torque is exceeded, torque delivered to the load plummets to zero and a recovery algorithm must fix the problem. This control also suffers from the traditional problem of stepper resonance excitation. Algorithms abound to reduce the effects of stepper resonance but none completely eliminate the issue. Just like a traditional open-loop stepper, the motor can run hot because the control applies full current to the motor whenever it’s in motion. The algorithms are especially useful when a profiled trajectory must be maintained under varying load. This type of control still suffers from the main weakness of traditional stepper motor control (that once pullout torque is exceeded the torque delivered to the load plummets). This type of control also suffers from the stepperresonance problem. A wider variety of applications can use this type of control. In addition to point-to-point motion, the drive can execute profiled motion and coordinate axes. Machine builders can use the motor’s full rated torque because this algorithm doesn’t experience pullout issues; full torque is maintained up to the maximum limit. The drive can use the motor’s full torque, but the system delivers only as much torque as is required at any point in time. This reduces motor heating associated with traditional stepper drives and other closed-loop controls. This control method completely eliminates the stepper resonance issue because the motor is no longer operated as a stepper. HOW DO I GET THE RIGHT CONTROL FOR MY APPLICATION? Machine builders must ask: Which control scheme does the application require? It may not be immediately apparent which control scheme the drive uses. Therefore, ask the manufacturer for details and review the documentation to ensure you get the right control scheme.